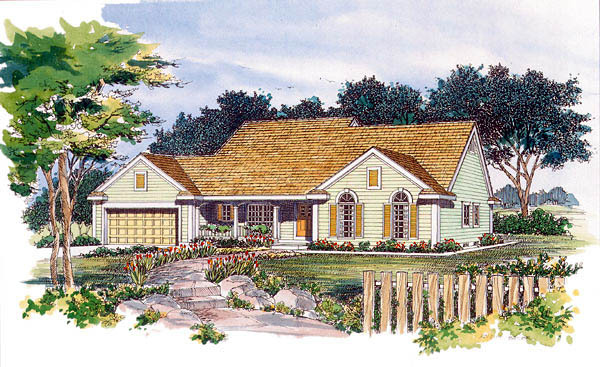 Country living is the focus of this charming design. A cozy covered porch invites you into the foyer with the sleeping area on the right and the living area to the left and straight ahead. From the windowed front-facing breakfast room, one enters the efficient kitchen with its corner laundry room, large pantry, snack-bar and passes-through to the gathering room and entry to the dining area. The massive gathering room and dining room feature sloped ceilings, an impressive fireplace and access to the rear terrace. Terrace access is also available from the master bedroom with its sloped ceiling and master bath that includes a whirlpool tub, a separate shower and a separate vanity area. A study at the front of the house can also be converted into a third bedroom.